Just a reminder that this Sunday, July 15, is the last day to redeem your Plant Card. After that, we will go on Summer Hours of Fri and Sat, 9-5. 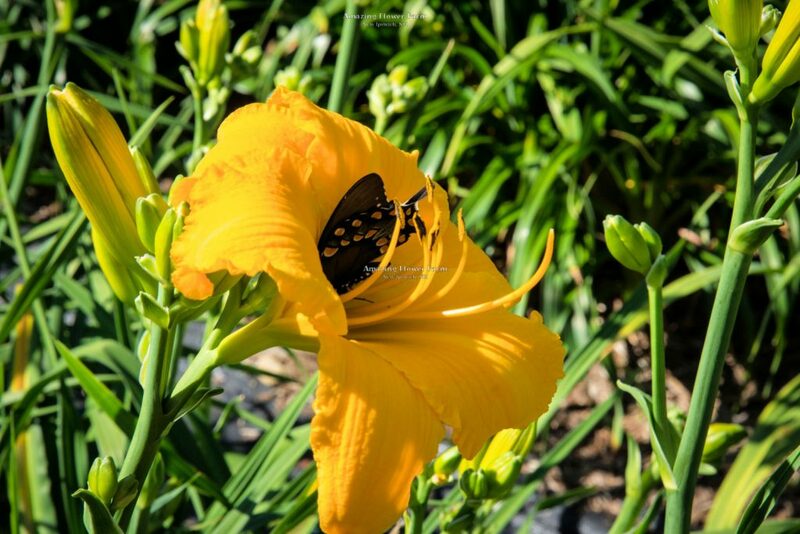 For Summer Hours, we will have perennials, daylilies (more varieties blooming every day now!) pick-your-own flowers and possibly in a few weeks fresh tomatoes and herbs. 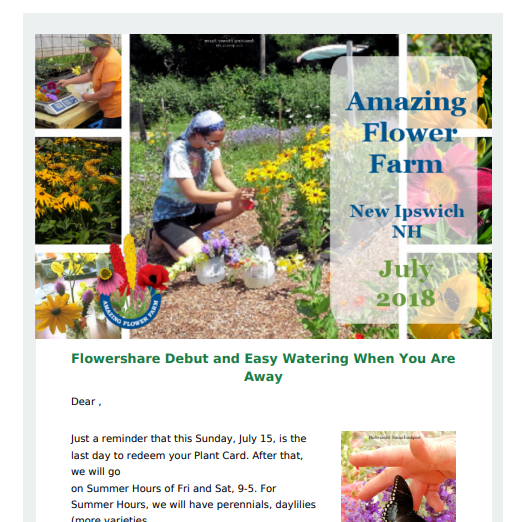 If you know anyone who might be interested in our Flowershare bouquets, please forward this newsletter so they can help us set it up in the most convenient way possible. 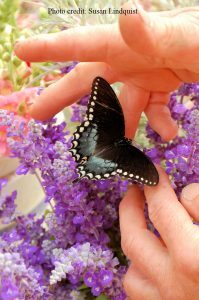 If you want a tip for making sure your plants get watered when you are away, please scroll to the end of this newsletter. 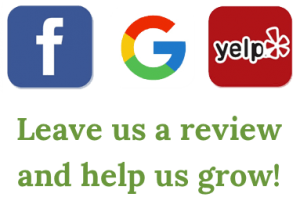 Many thanks to the customers who shared their bouquets with us – Susan Lindquist, Julie Bluebell, and Carrie Knight Cormier! Our cutting flower beds are coming along nicely. This is our first year, so it is a big experiment for us and we’d love any feedback. Here is our first customer picking her bouquets. She said it was great fun! Pick-your-own flowers are priced at $12/lb, and the amount you see on the scale is about ½ lb, so that bunch of flowers came out to about $6. 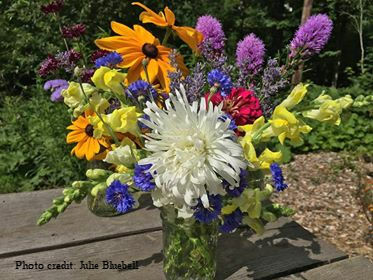 We planted a diverse selection of flowers this year so we could learn which ones we (and our customers!) like the best. We’ll be open on Fri & Sat 9-5 for Pick-Your-Own. Please call ahead (603) 878-9876 (and maybe also email) to arrange an appointment outside of these hours for picking for a special event. At mid-week we plan to have our staff pick for a Flowershare. A Flowershare is a form of Community Supported Agriculture (CSA), which helps local farms survive. We’re thinking of doing a subscription for weekly or bi-weekly bouquets. If you’d be interested in regular bouquets for your home or business this summer, please let us know! grown naturally without chemical pesticides. 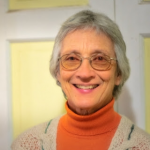 Please Help – We Need Your Feedback! There are several questions about Flowershare we haven’t fully worked out yet. We’re thinking of keeping it really simple and doing two sizes: shorter bouquets for easy conversations across a table, and regular taller bouquets. If you’d like to give us input, there are a few questions we’d love for you to answer. Please consider completing our two minute survey. Thank you so very much for helping us develop a program that meets our customers’ needs! 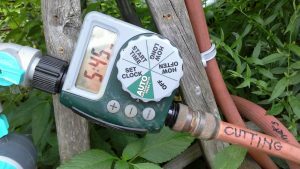 Here’s an option for watering when you go on vacation if you don’t think your human waterer will be reliable: an electronic hose-end water timer, which you can get at most hardware stores for around $30. We have several for our vegetable garden, daylily beds, cut flower beds, and greenhouse tomatoes. They are pretty simple to program, you can tell it how often to water, how long to water, what time to start, and usually they have a rain delay function as well so you aren’t wasting water if we get a good natural rain. The simplest way to use it is to set it up with a sprinkler, although we use ours with drip irrigation, a bit more of an investment but less water usage. We set up a few drip lines for vegetables in pots and an automatic timer for our son’s house. He loves fresh vegetables but is too busy with work to tend a garden. The system is so easy it convinced me anyone can have a garden! New daylilies blooming every few days!